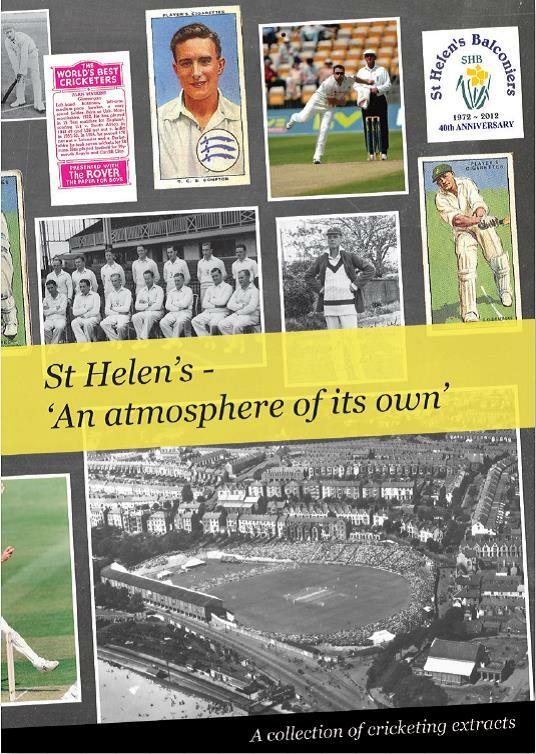 St. Helen’s – ‘An atmosphere of its own’ was published in 2012 as part of The Balconiers’ 40th anniversary by celebrating the Glamorgan cricketing ground. It is a nostalgic collection of St. Helen’s memories from both visiting and Glamorgan players ranges across the years from W.G. Grace’s appearance in 1876 to Robert Croft’s 1,000th wicket in 2010. There are over fifty extracts by a variety of authors in this beautifully produced 72 page A4 book compiled by Swansea-born Glamorgan member Richard Bentley. The book is available for a donation of £5, or £7 including postage, and can be ordered through John Williams, Chairman of the Balconiers. Please see the Contact Us page or email john.balconiers@hotmail.com. Everyone has a favourite ground … The fondness that so many people have for the St. Helen’s ground resonates from each and every one of the 72 pages of this handsomely produced anthology. The well-chosen extracts from a number of famous writers are supplemented by some excellent historic images with the content ranging from W.G.’s appearance at the ground in 1876 to Robert Croft’s 1,000th first-class wicket for his beloved Glamorgan. All in all, this nostalgic booklet forms a fitting tribute to the St. Helen’s Balconiers – the loyal band of supporters who energetically organise the annual festival at the ground overlooking Swansea Bay, and who celebrated their 40th anniversary last summer . 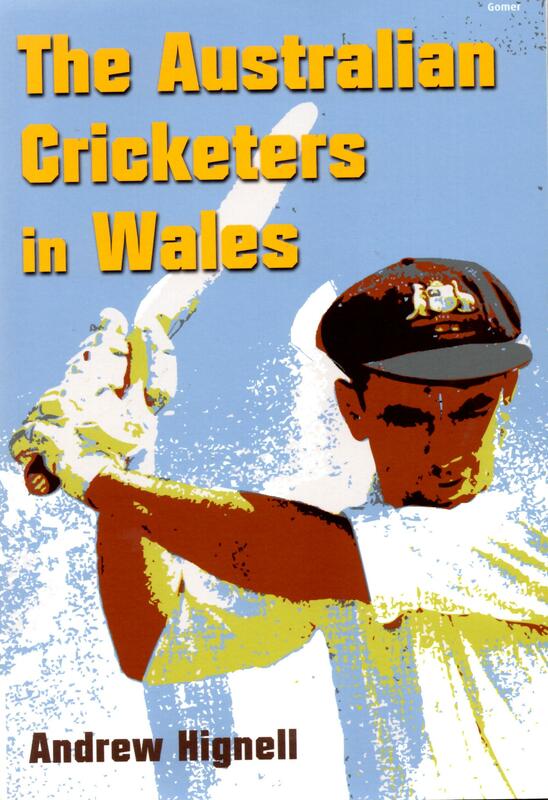 This is the Swansea-born author’s first publication with a cricket theme and he should be warmly congratulated for his painstaking and thorough efforts in producing such a delightful and readable publication which more experienced authors would struggle to surpass. As the author himself notes, “some grounds are part of sporting folklore … and one such ground is St. Helen’s”. Alun Wyn Bevan’s book explores both the cricket and rugby heritage of the historic ground, with chapters (including superb photographs) on a range of sporting heroes and memorable moments. 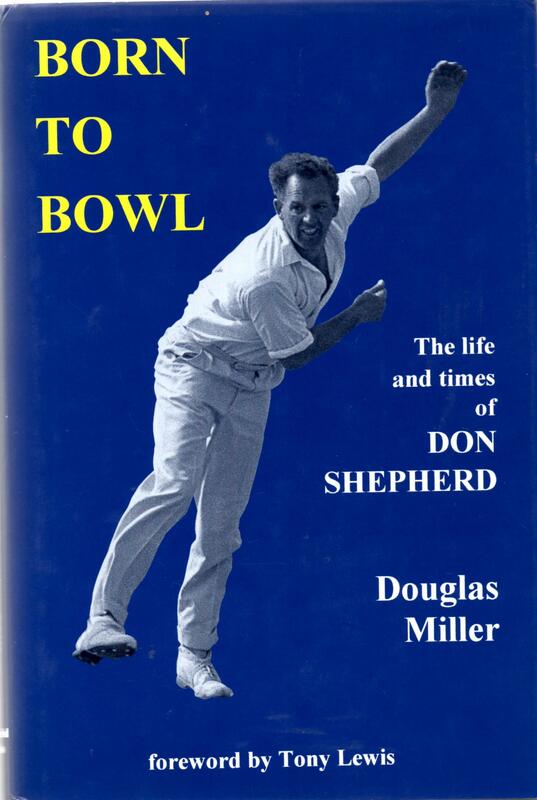 The first chapter of Douglas Miller’s excellent biography of Gower-born local cricket hero Don Shepherd is, appropriately, titled ‘Birth of a Legend’! Don played a total of 668 first-class matches, 647 of these for his beloved Glamorgan (and many at his ‘home’ ground of St. Helen’s), in a career spanning the years 1950 to 1972. Astonishingly, over one third of the 22,098 overs he bowled were maidens, and his career wicket-tally was 2,218 at 21.32. As Tony Lewis observes, Don “would have been a pillar of any England side had he been chosen” – as it seems to be widely acknowledged he should have been! As Don himself reflects: “I was born to bowl … In a way it all just happened for me, and maybe there is some young cricketer out there, someone who hasn’t had the advantages, who can draw some inspiration from my story.” Everyone reading ‘Born to Bowl’ will draw inspiration – and a great deal of enjoyment – from Don’s story. 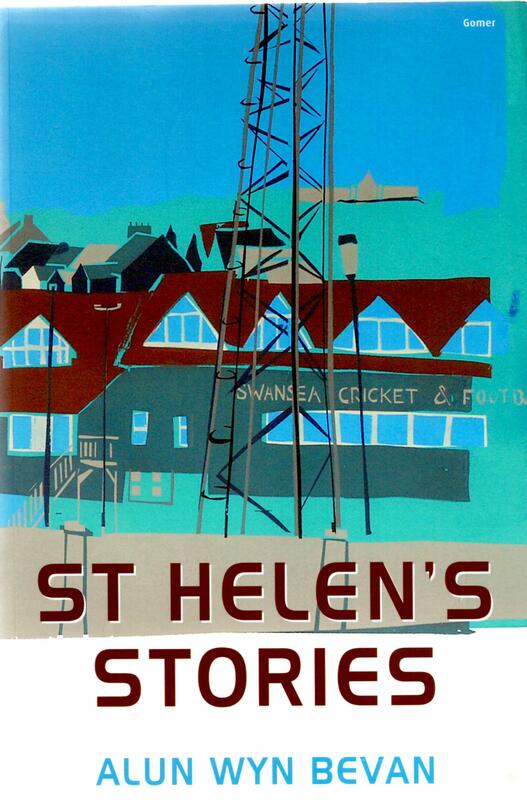 Cricket historian Dr. Andrew Hignell, Glamorgan CCC’s scorer and archivist, includes a detailed and carefully researched chapter on the history and development of St. Helen’s in his book covering a total of twenty grounds used by Glamorgan over the years. 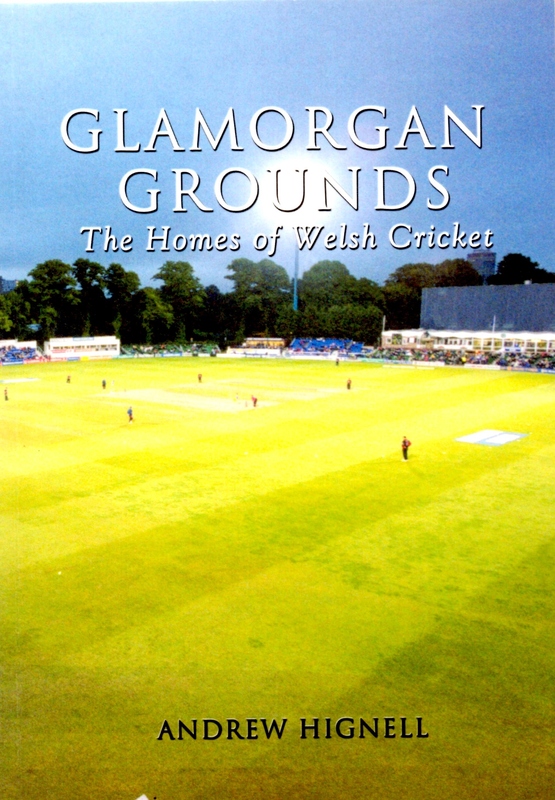 Dr. Andrew Hignell, the familiar voice of Public Address announcements at Glamorgan’s home matches – and the County’s official scorer and archivist – includes several chapters on historic matches at St. Helen’s in his book on visits by touring Australian teams to Welsh grounds. One chapter, titled ‘The Swansea Don’, relates to Don Bradman’s first visit to Swansea in 1930. Bradman had come to the wicket towards the end of a rain-affected first day, but soon after breakfast on the second day “there were already long queues outside the St. Helen’s ground, with thousands of men, women and children eager to see ‘the Don’ continue his innings”. Amazingly, there were 25,000 in the ground for the start of play, with others cramming in as Bradman moved towards a stylish half-century. The story of Bradman’s second – and last – appearance at Swansea in 1938, is also detailed in the book – again with some excellent pictures. Andrew also includes well-illustrated chapters on the famous visits of the Australian tourists to St. Helen’s in 1964 and 1968 – both of which resulted in exciting and historic victories for the home team. In the first match, it was captain Ossie Wheatley who captained his inexperienced Glamorgan side to a famous victory, with spinners Don Shepherd and Jim Pressdee taking 19 of the Australian wickets between them. Just before the 1968 game, captain Tony Lewis was taken ill and the home side was led by Don Shepherd to another historic win – prompting further celebrations at St. Helen’s as another disbelieving crowd gathered on the field at the foot of the long steps to sing and listen to speeches from both captains.